I thought it was about time I re-introduced this one, as I always had so much fun finding 3 things to feature. 1. People I’d like to punch in the Face – I’m not entirely sure how I found Jen’s blog, but once I did I was hooked. I went back to the beginning and read my way through her entire archive. She has a great sense of humor, a lot of snark and she doesn’t take herself too seriously (my pet hate is people who snark on everyone else but can’t handle any snark back). One of my favorite recent posts is , do check it and the rest of this blog out. 2. 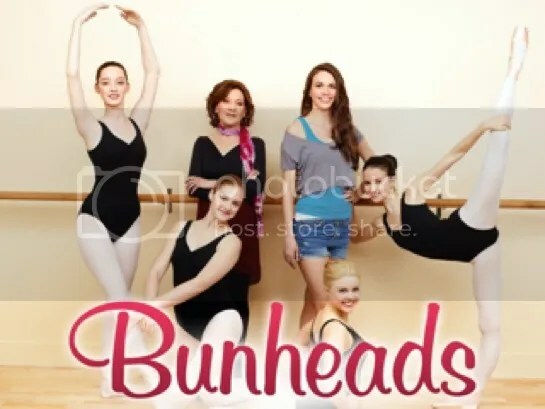 Bunheads – Did you LOVE Gilmore Girls? Then you need to check out this new show from Gilmore Girls creator Amy Sherman-Palladino. Don’t let the first episode fool you it only gets better. The quick quips, small town drama and the amazing Kelly Bishop, all work together to draw you in. And if that isn’t enough there is the “Spot the Gilmore Girls alumni” drinking game, fun for everyone. Unfortunately I can’t find any news on who (if any) has bought the UK rights, but in the US the series was back from it’s mid season hiatus yesterday, one of the highlights of my week. 3. 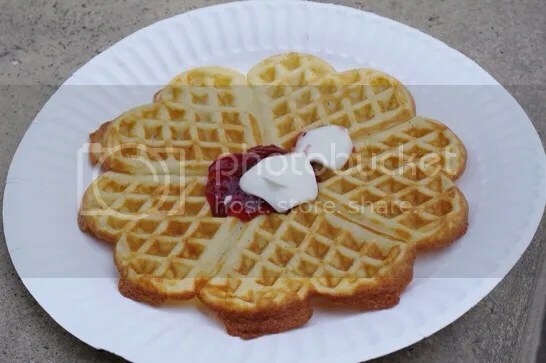 Norwegian waffles – I LOVE waffles, they were always my favorite treat as a kind. Warm, freshly made, with a bit of butter, jam, sour cream and/or cheese, they were just divine! And since I have an amazing husband I started the new year as a waffle maker owner ( best Xmas gift EVER), now I can have a little taste of the old country when ever I want! Do you have anything you’d like to share? 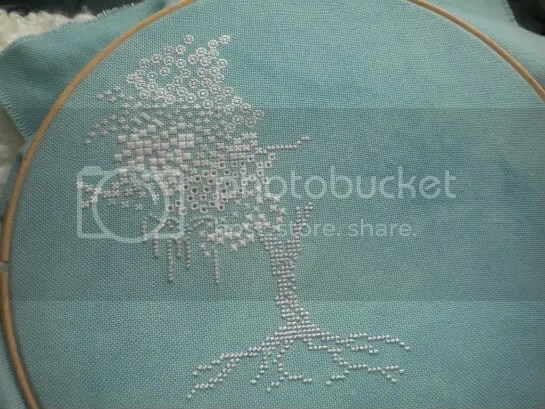 I finished the cross stitch on this cushion ages ago, there is even a post about it. Yikes, that was 2 years ago! Well you will be happy to know it did not take me two years to finish it into a cushion, I got a sewing machine as a wedding anniversary gift in October 2011 and made it up shortly after that. But it has taken me since then to blog about it. I love the light brown and ivory striped ticking cotton fabric I used for the backing and while the pom-pom trim was a pain in the backside to stitch on (and is nowhere near perfect) I’m glad I persevered with it. 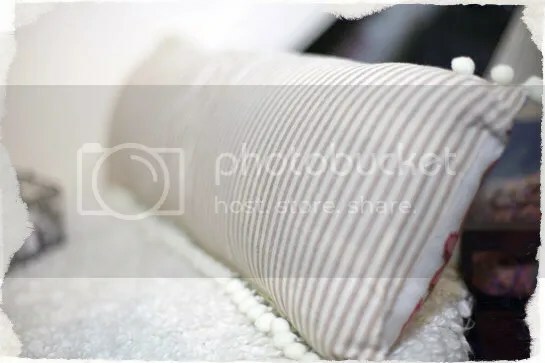 I bought the fabric from a fab eBay seller, they had the most amazingly gorgeous fabric (expensive though), but they don’t seem to be selling any more, which is a shame (don’t worry, I did stock up quite a bit while they were in business). 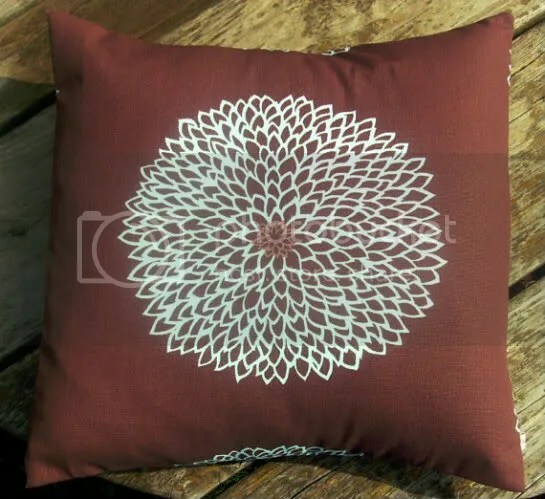 It took me forever to find an inner for it, if making a cushion cover I would definitely suggest finding an inner and making the cushion cover to fit it rather than the other way around. My inner is not a perfect fit, but it was cheap (from ikea) and the best I could find. 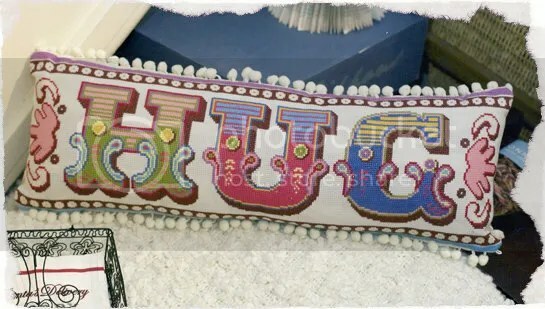 I love my HUG cushion and I wish I had my KISS one finished as well since they would look so great together but that particular WIP has not been touched for a while. To be honest I haven’t even stitched since last summer, completely lost my bug. I have a feeling it will be back soon and hopefully it will stay for while, long enough for em to finish some WIPs at any rate. I’ve not been very well over the Christmas period, and that has meant a LOT of couch/bed time. 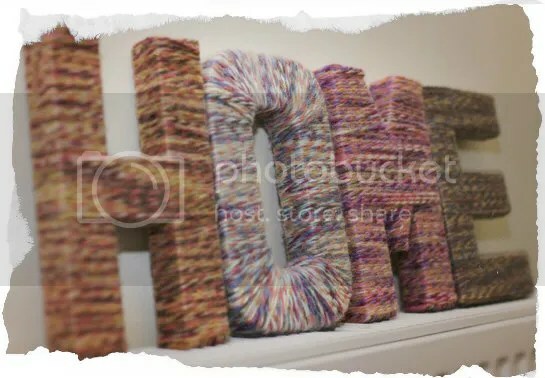 Luckily I found a super easy, enjoyable and great looking craft to keep me occupied – Letters wrapped in yarn. I’ve seen a lot of versions of this on Pinterest, and thought I should add my own version. 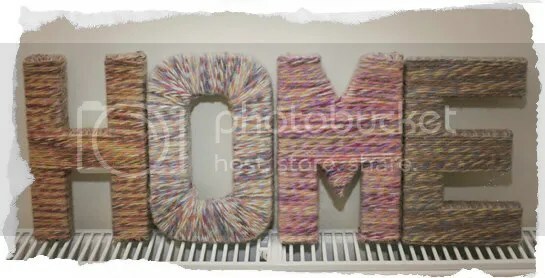 I got the letters from Hobbycraft, £1.99 each (although I think they are on sale at the moment so might get a few more). they are paper mache, but wood ones would do just as well. The yarn was on sale, £1.50 each, I’m sure I could have found some cheaper on ebay or elsewhere, but I wanted to get started straight away. In addition to the letter and yarn I used double sided tape and a hot glue gun. I started with the H, deciding first how I would cover it. In the end I decided that the main layer should be horizontal, I started by doing the tops and bottoms, fastening the yarn with double sided tape, then I completely wrapped the middle vertically before doing each leg. The H was without a doubt the easiest to wrap, the O was the worst. The M was ok apart from the pointy middle bit, luckily my hot glue gun was great for making the yarn stick there. Same with the E, having all those ends were fiddly but the glue gun was a great help in making them stick. I’m really pleased with the end result, and I’ve already got a commission from my mum to make another one. And I’m making another one for me saying LOVE (predictable I know). 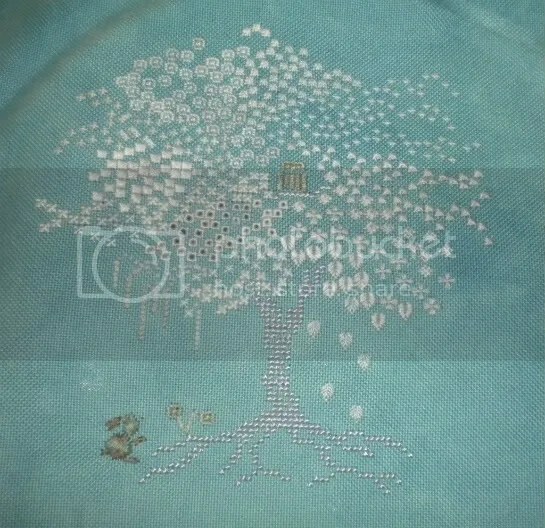 In June I started the Sleeping Beauty’s Castle Mandala (AKA the Anniversary Mandala AKA Fairy Tale Castle Mandala AKA Online 95) from Chatelaine Designs. I’ve been wanting to stitch one of Martina’s gorgeous designs for a while now, but this is the first one that screamed “STITCH ME! STITCH ME!”. What could I do but oblige? 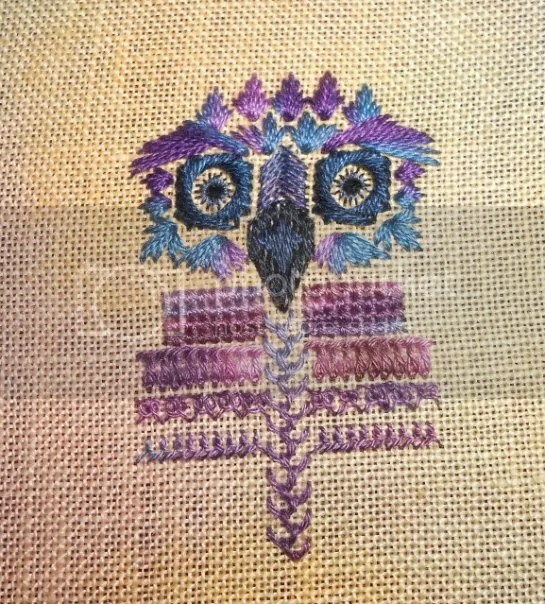 I bought the kit (sans fabric) from European Crossstitch Company, once it was shipped it arrived very quickly from the states, excellent service all around. I got my fabric from the always dependable Sew and So, 32-count Antique Blue Belfast linen from Zweigart. It’s a very, very pale, slightly mottled blue, as of yet none of the pictures seem to pick up the actually colour of it. As I said, I started it in June after three parts had been released, but I’ve only just finished part 1. 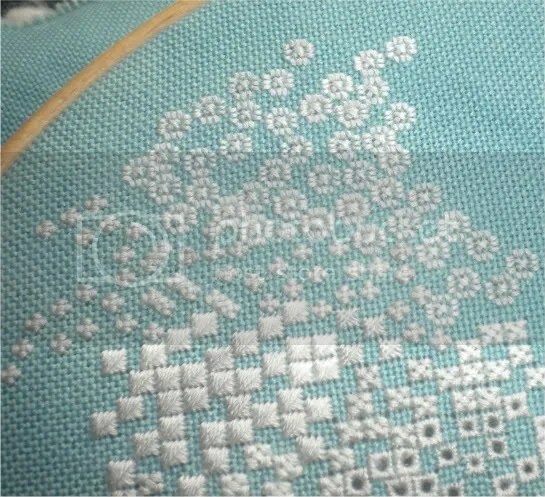 It’s been a bit slow going, the pure cross stitch part seem to take forever and it was super boring, I just wanted to get to the specialty stitches (patience is NOT one of my virtues). In the beginning I took a picture after each colour change, but towards the end I kind of forgot. I promise I will aim to do better for part 2. But here is a slide show of part 1 so you can see the progress. There is a part missing, the beading. I will bead as I go, but I decided to leave the beading in part 1 until I’m ready to start the part 2 beading as there are some bead heavy motifs there. I won’t be starting part two straight away, I have a small project I want to finish first. However, by the beginning of next week I think I’ll be ready for part two. In June I joined Manuela from Le Crocette di Manu/The Shop Around The Corner‘s Waiting for Christmas SAL. I know, Christmas in July, am I going crazy? Well it’s not like we’ve had a proper summer here in Britain yet anyway so might as well get on with autumn and winter planning. I started this pretty much straight away and it was a quick and easy design to stitch, however I’ve been more than a little lazy about posting the pictures lately, so here they finally are. I really love this design, not sure how I’m gonna finish it, but I’m sure I’ll figure something out. 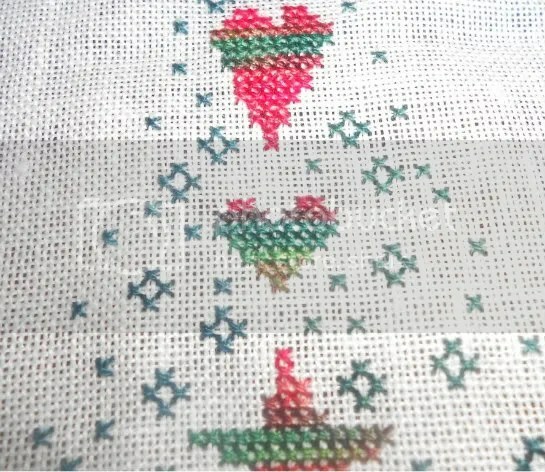 I can’t wait to stitch the second part, as part 1 was so beautiful! I’ve recently started making our house into more of a home. Previously I’ve had the attitude that “Oh we’re only renting, probably won’t stay here long so why bother? !” Well we’ve been in our current (TINY) flat for over a year now and we’ll be here till Dec/Jan (but then we are definitely finding something bigger), so in the mean time I’m gonna to the best I can to turn this into my dream flat. Because what I’ve finally understood (yup, I’m a little dense) is that you can take everything with you when you go and recreate your perfect rooms in your new place (they may even be better). What really got me going on the redecoration was two things; 1) Pintrest – so addictive and so much fun. It’s such a great way of keeping your good ideas reasonably organized, I used it the way I used to use bookmarks, but because you have the pictures there it’s so much easier to find exactly what you are looking for. My second reason is far less fun, here we go 2)Ants – In June (once we came back from holiday) our house seemed to be infested with the nasty critters so I went on a cleaning frenzy, and discovered that my temporary storage solutions various cardboard boxes under the cabinets, stairs etc made cleaning extra tedious and time consuming. 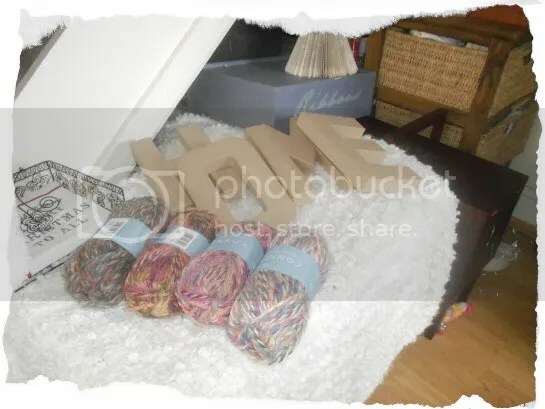 SO I guess my plan is to de-clutter, find a place for everything, especially my crossstitchcraft supplies (a year ago it was just cross stitch now there supplies for sewing, jewellery making, card making etc. it just keeps growing), make it all look a little more put together. I’ll let you know how it goes, and I’ll even show you some pictures once it looks better. 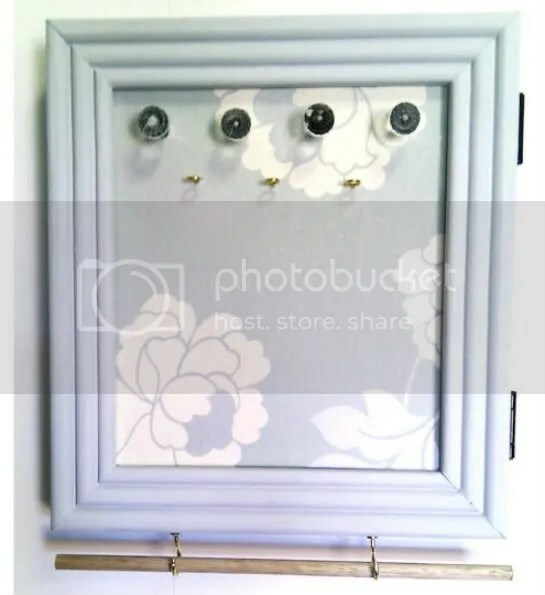 One of the places I find a lot of inspiration is etsy. There is so much there, creative and vintage mixed, newly crafted and re-purposed all together. Sometimes I look for specific things other times I just put a color into the search box. 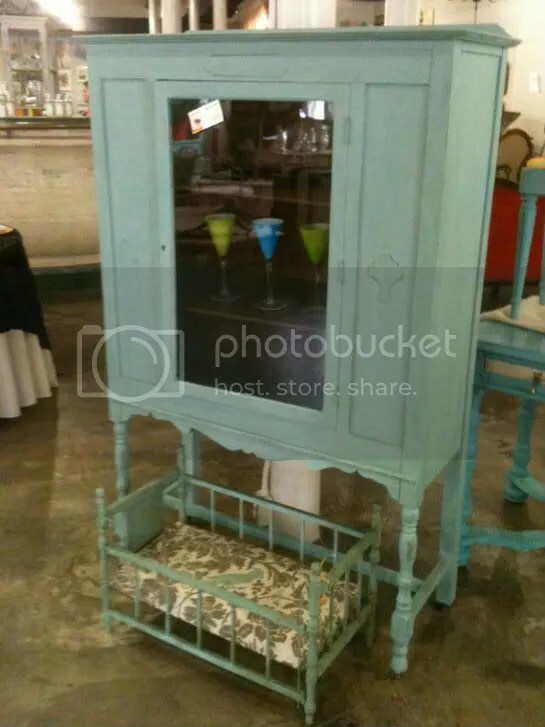 I feel a little naughty for showing the first one considering it’s sold but it’s so pretty, and actually something I’d consider for my kitchen if it was bigger (the kitchen, not the cabinet). I love this one, especially how they’ve framed the wall paper to make it a bit more interesting. Have I ever told you how much I LOVE felt? Well I do, it’s so versatile, comes in great colors, it’s durable and this case look so, so pretty. It’s on sale at the moment too. 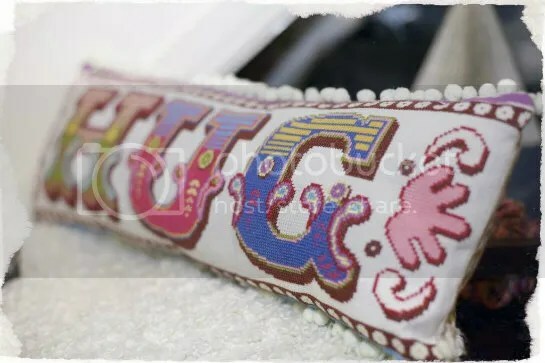 Brown and duck egg blue is a wonderful color combination, one of my favorites to be honest.The cushion is simple and unfussy, how can yu not love it? It happens ot be on sale as well. 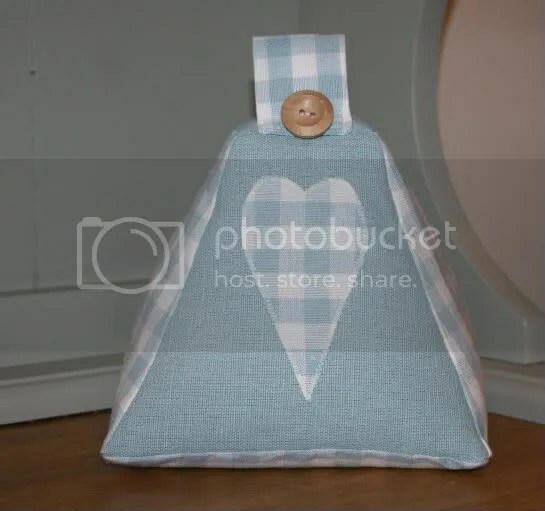 Doorstops seem to be everywhere at the moment, and this pyramid one made with Laura Ashley fabric is just darling. Does anyone else like Duck Egg Blue? I doubt I’m the only one. I actually finished Abi Gurden’s Tree of Stitches back in October, it was even before my camera broke so I had pictures of it, but for some reason I never posted them. Well today is your lucky day, not only will you get to see the finished masterpiece (modesty is my middle name), but I even have a not seen before WiP picture to show you (exciting stuff, I know). When we left off (back on September 5th) I had finished parts 1-6. 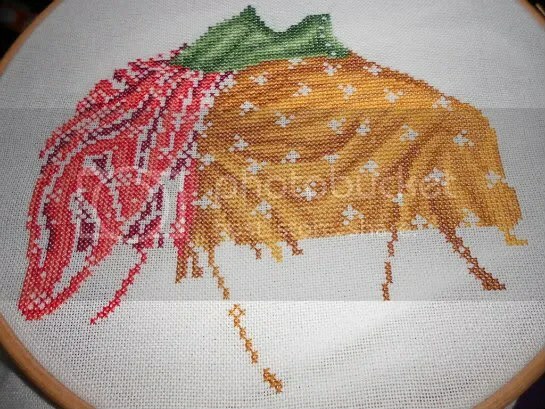 Here are the next 2 stitches/part, part 7 – Jerusalem Stitch and part 8 – Floral Stith. After that it would appear that I just got too lazy to chronicle my TOS adventure, and the next picture I have is of the completed tree, with it’s furry and feathered friends. 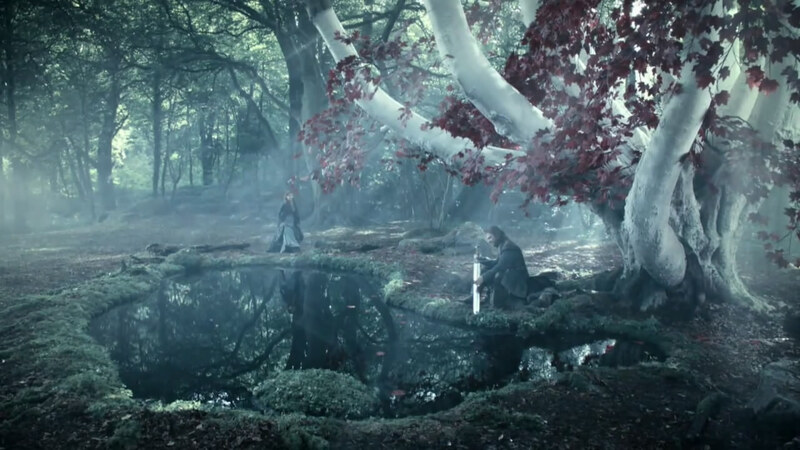 My White Tree of Gondor (sort of). 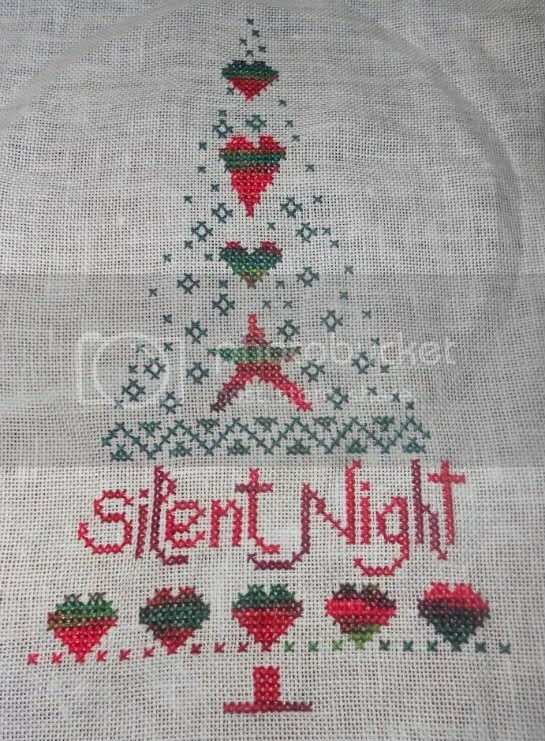 The stitches that make up the rest of the tree are (in order from Floral stitch): Norwich stitch, Star Stitch, Rhodes square Stitch, Fancy Cross, Tied Windmill Stitch and Leaf Stitch. 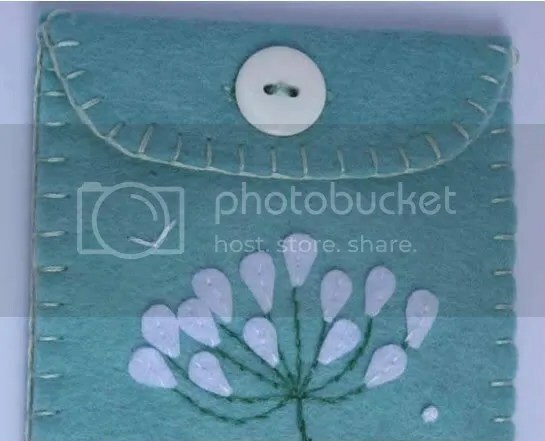 Lester and Horace (owl and bunny) are made up of Straight Stitches, Knit Stitch, Oval and Octagonal Rhodes Stitch. And here is a recap on the material used. I haven’t done anything with my finished tree, it’s rolled up with my other finishes longing for some attention. I’m planning to give them some very soon! If you haven’t heard of The Victorian Motto Sampler Shoppe then allow me to enable you, they have lots of beautiful floss, ribbons, lace and more. Please go have a look, you won’t regret it, well your bank balance might. If so head on over to Alissa’s beautiful blog, Starry Nights Studio, and join here giveaway for a chance to win three beautiful friendship themed patterns. 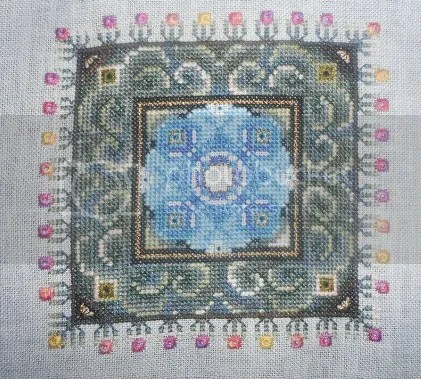 And don’t forget to have a look at the rest of her blog, it’s full of beautifully finished cross stitch pieces. I wish I had even half that much talent when it comes to finishing. Right, this is almost two weeks late so please forgive me. For the first time I signed up to be part of the International Hermit & Stitch weekend. IHSW occurs monthly on the 3rd weekend of the month and at the end of at weekend you post pictures of your progress from that weekend. So here is my update showing progress on the two projects I worked on. The pictures were actually taken on the Monday after IHSW, but I’ve just been slow with the posting (as usual). First up is my progress on my Josn Elliott Christmas Lady. Her skirt nowalas a fair bit of red in it, I’m currently much further a long on this one, but I can show you that after the weekend. My other project which got an outing during the IHSW was Abi Gurden’s The Great Escape. My beautiful owl has a head now. I haven’t touched this since this picture was taken, but the next part has been printed off and I think I’ll pick this one up at some point this weekend. And since I know there are people who will ask, these are the colours I’ve used on him so far. I have one more purple shade to use while will be on the wing feathers, but first I’ve gotta finish off the breast feathers.